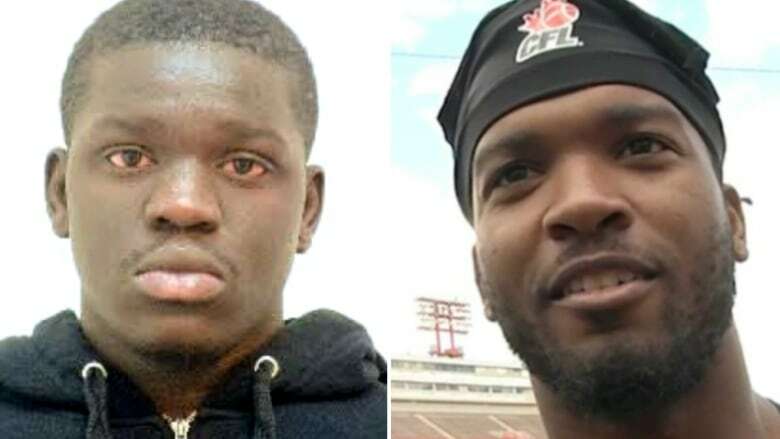 Calgary Stampeders' receiver DaVaris Daniels described Tuesday how a confrontation outside a bar escalated to a glass being thrown and then the shooting of his friend and teammate Mylan Hicks. 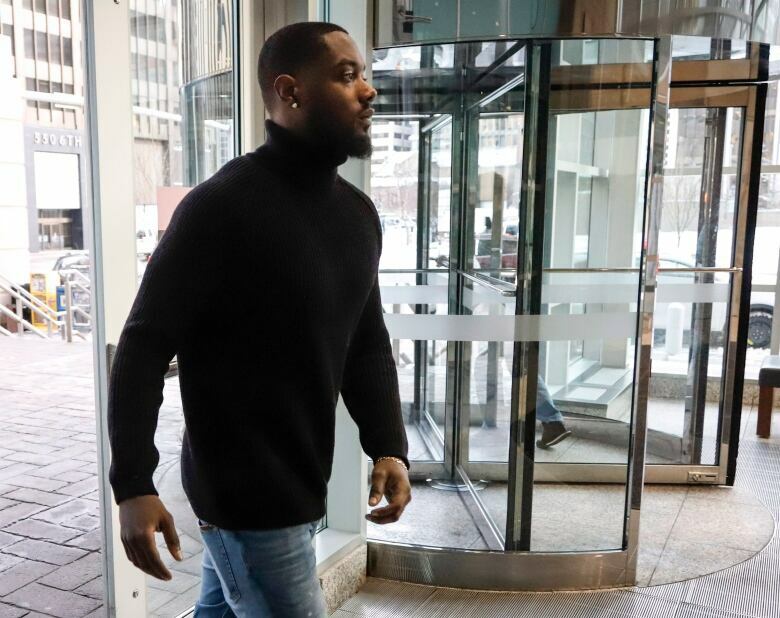 Daniels, who caught seven touchdowns for the Canadian Football League team this season, told the court that he, Hicks and another player were standing outside the Marquee Beer Market after closing on Sept. 25, 2016. This taxicab dash-cam video shows the loud, busy and alcohol-fuelled crowd scene outside the Marquee Beer Market as shots were fired on Sept. 25, 2016. Calgary Stampeder Mylan Hicks was killed in the incident. Daniels said two people were in Hicks's face, and one of the people escalated the situation even further. "There was a glass thrown by him. After that, I remember watching him take a few steps to the left and pulling out a gun. I don't know where he pulled it from," Daniels recalled. "I saw it in his hand. I saw him come around. I saw him shoot at the ground first." Nelson Lugela, 21, has pleaded not guilty to second-degree murder in Hicks's death. Hicks was a member of the Stampeder's practice roster and court has already heard the team was out celebrating a win over Winnipeg when the shooting happened. Daniels said he was just a few feet away from the gunman and described Hicks's reaction. "I remember when it happened, the first shot kind of froze him. I don't think he expected it to get to that point. He was trying to run but he was kind of like frazzled for a second and then I remember him taking off," said Daniels. "I went the opposite direction into the parking lot trying to get away from the gunman as fast as I could. I wasn't sprinting because at the time I didn't think it was that serious ... that he was just trying to scare people. I just went into the parking lot and I heard more shots." Daniels said that when he thought everything had calmed down, he ran into another player, Roy Finch, who told him Hicks had been shot. "He's telling me that 'They shot him, they shot him.' I'm like 'No way. It's not happening. It's not true' ... As soon as I got around the corner, I saw Mylan," Daniels said. "He has one shoe off and his pants had fallen to the ground. I remember Jamal (Nixon), my roommate, was holding him, covering up whatever wound he had. He was kind of gasping." The shooter and two other young men jumped into an SUV and sped away. Police arrested three people about 45 minutes later near the scene of the shooting. Both Daniels and Derek Dennis, who testified Monday, spotted the suspects while being driven to the police station to give a statement. Aaron Ostlund, a doorman at the bar, testified he noticed a "big ruckus" outside and "a lot of shoving and pushing going on." He said he saw a silver BMW SUV pull up in front and a man jump out. Paul Power, a manager at Marquee, said he talked to two groups who were involved in an altercation over a spilled drink earlier in the evening. He said he thought it was settled and then heard about the shooting. "(Dennis) was yelling, 'That the guy in the white polo shot my boy.' He was loud, very excited, agitated, emotional," said Power, whose brother played with the team. Power said he immediately checked the club's database of all patrons who were scanned in that night to see if he could identify who was involved. The judge-alone trial, which is to last two weeks, was purposely delayed until after the recent Grey Cup game which Calgary won. Bill Graveland is a Calgary-based reporter for The Canadian Press.